Rising early, Mr F- and myself broke our fast with some traditional West Country fare, comprising mainly pork products, eggs and various pressed fruits. Despite our tiredness from the previous night’s jollity, we were concerned to be on time for the day’s events. I swiftly sewed a navy ribbon onto my blue printed cotton dress, in order to match it more fully to my spencer and bonnet trimmings. Mr F- is so droll, he claims all such additional adornments are mere flim-flam, despite he and his military chums being covered in so much frogging, braiding, shiny buttoning, and dangling epaulettery that they are practically invisible beneath it. Mr F-, of course, was in his Silesian Landwehr uniform, looking less smart and more ‘functional’ than perhaps other military men in the parade. However, we were most grateful for his utilitarian approach, as he had so many useful items hanging from him (such as blankets, water bottles, knapsacks in which to stow purchases, etc). I wore my new Bergere straw hat over a lace cap, the dark blue spencer I bought at the start of the season, and the blue print cotton dress. Alas, on my feet, I could only wear very old fashioned latchets, which were disastrously hobbed with iron nails. Bath’s pavements and steep inclines were therefore the cause of many a small slip, causing me to clutch nearby Rifles officers for balance on several occasions. We made our way to the Assembly Rooms, where we met our dear friends Mr and Mrs H-, and Mr and Mrs Sc-. Mr and Mrs Sm- were a little late, perhaps due to the excessive effort Mr Sm- insists on spending on his appearance. Mrs Sm-, of course, looked so very lovely in her dress, striped blue and white in a most becoming style. Mrs Sc- was wearing a new pale blue bonnet and spencer, a delightful addition to her wardrobe. Mrs H- had her lovely gold spencer over a cotton dress, and a small picnic basket. Together with the gentlemen, we made a remarkably authentic addition to the crowd seeking to gain access to the Assembly Rooms. After a delay, we were admitted, presented with our tickets for the Grand Promenade, and instructed to remain in the Room. An unconscionable amount of time passed, with the Room becoming ever more crowded and stifling, and people forced into closer proximity than any would choose. Mr F- and myself amused ourselves by instructing an overseas visitor (from Sweden, no less) in the proper styles of hair for elegant females of particular ages. Just when we thought we could bear no more, and I was on the point of collapse, Mr Adrian Lukis, the new patron of the Jane Austen Festival, was introduced to us from the balcony. What a cheer was heard for this gentleman, looking just as pleasing as in his Mr Wickham days! There followed some interminable idiocy with film crews and photographers, before a whistle blew and we were counted for an entry in a notable book, which collects information on this kind of thing. We were finally released into the sunshine to begin our Promenade around the town. More than five hundred of us made our way through the local crowds which had gathered to witness the procession. Many overseas guests were also witness to our progress, and exclamations in more languages than I could count were heard. For some time, we displayed ourselves in this manner, Mr Sm-, inevitably, more than others. I was delighted when we reached the Gardens, where there was dancing, picnics, and other diversions for the enjoyment of all. We rested ourselves on Mr F-‘s blanket, despite his protestations that ‘he would never get it rolled up again’. How we laughed at his discomfort! After an excellent feast of ham sandwiches and carbonated beverages, we gathered ourselves to visit the fine purveyors of goods who had inhabited the Guildhall for the afternoon. I was quite beside myself to see the latest fashions at Farthingale Historical Hats, who did not disappoint in their selection of headwear. I was also most tempted by a silk parasol which looked to be the very thing for keeping the sun from my delicate skin, but alas, I will have to save my allowance for some time before it is within my grasp. 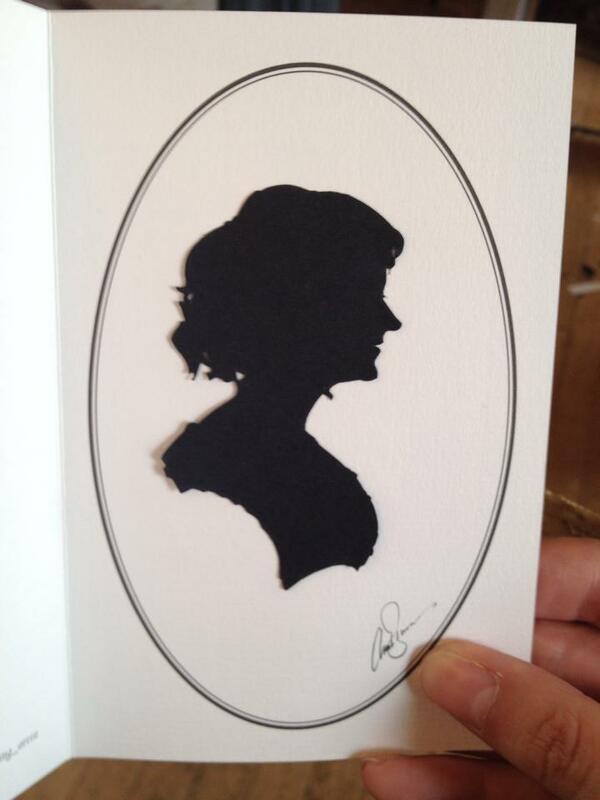 To mollify me, Mr F- arranged for me to have my silhouette cut, an experience which has provided me with a most becoming memento of the weekend. Mr Wickham no less??? I am all astonishment. How I enjoy these missives. I wonder if a care was remembered for the servants stuck in the kist he’s and parlours of he fashionable houses, picking up more ribbons than are on display in Fords? !